Evergreen ground cover plants for shade are much in demand, and Omphalodes cappadocia ‘Cherry Ingram’ is a great choice. The common name of ‘Navel Wort’ does not best describe its attraction. 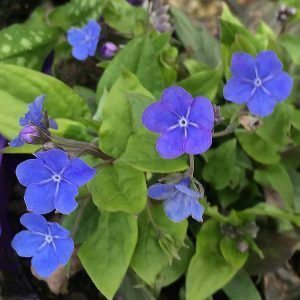 Deep green foliage that forms a dense clump over time, and with clear blue flowers in spring to early summer make this versatile landscaping plant. It can be used to underplant trees and shrubs, both in the ground and in containers. It works well between clumps of other shade loving plants such as Hostas, Trillium, Ferns and Astilbe. Heart shaded foliage and frost tolerant as well, Omphalodes Cherry Ingram can also be used to plant amongst the larger growing spring flowering bulbs, allowing the bulbs to poke up through the foliage. Best in a humus rich well drained soil. Water in well with a liquid seaweed fertiliser, and provide water through the first summer. Once established Omphalodes Cherry Ingram is relatively drought tolerant as long as it is grown in shade. In very hot summer, of in a sunny position it may require some supplementary watering. A little general purpose fertiliser in spring, and an occasional top dressing with blood and bone will get the plant looking healthy.